The video streaming industry can easily be described as a crowded space with established incumbents such as Netflix (NFLX), Amazon (AMZN) Video, Hulu, and YouTube being challenged by infiltrators like AT&T (T) and Disney (DIS). The competitive landscape seemed to be quite predictable with just the incumbents, and sure the dynamics of the industry have evolved. But when two big players make major acquisitions that include content, the state of the industry is apt to change considerably, to say the least. With big players like AT&T and Disney entering the playing field, it can a major concern for investors in Netflix, as the options available to consumers continues to grow, and, more importantly, some of the content that Netflix gets from Disney, Time Warner and Fox may go away – or become much more expensive. 2018 was a big year for the streaming world, as consumers continued to show their desire to “cut the cable cord” and break free from traditional cable providers. While Netflix continues to compete with Amazon Prime, Hulu, and HBO, several other new services were announced during 2018 and are expected to launch within the next 12 months. The most notable announcement came from Disney, who announced during a media conference that it will be offering a family-focused serviced priced below Netflix comprised solely of Disney content. Additionally, Disney announced that its content currently on Netflix will be exclusively available on its new service once their licensing deal expires in 2019. Disney’s new service, Disney+, is expected to launch in late 2019. What makes Disney’s entrance in the streaming world even more interesting is the closing of Disney’s acquisition of Century Fox, which is expected to happen in early 2019. Upon closing, this will make Disney the majority shareholder of Hulu. Given the large scale of Disney (especially when including Century Fox and Hulu), its deep pockets will allow it to more closely contend with Netflix for production value without any capital constraints to invest in the business. The media industry overall has seen a wave of consolidation over the last year and into 2019 as traditional cable TV providers try to combat this cord-cutting trend. A notable example includes AT&T’s purchase of Warner Media and its media properties including CNN, Crunchyroll, the CW, DC Comics, HBO, and a 10% stake in Hulu. As a result of this acquisition, streaming services HBO Now, DirecTV Now, FilmStruck, AT&T Watch, the recently launched DC Universe, and the recently announced unnamed Warner Media service will fall under the AT&T umbrella. Additional consolidation includes the previously mentioned Disney acquisition of Twenty-First Century Fox, Inc. (NASDAQ:FOX) (NASDAQ:FOXA) and Viacom’s recent acquisition of Pluto TV (a free, ad-supported, TV service). This trend of consolidation, if continued, will increasingly make it difficult to justify subscriptions to standalone channels, such as CBS All Access, Showtime, and Starz. While new competitors continue to enter the market, the most popular services available are Netflix, Amazon Video, Hulu, HBO Go, and YouTube. 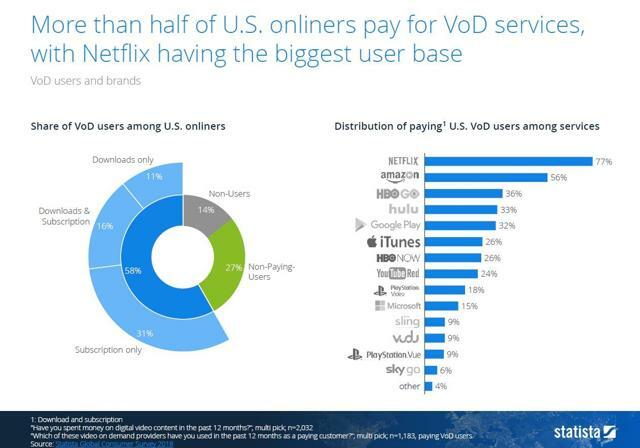 According to a 2018 survey conducted by Statista, 77% of video on demand subscriber (VOD) are paying for Netflix. Coming in second place behind Netflix is Amazon at 56%. I think it’s important to note that Netflix is more worried about a video game (Fortnite) than it is a major player in the industry (HBO). Netflix arguably produces some of the best content, and yet it is more concerned about a video game than its streaming competitors. Perhaps that is a signal that there is plenty of room for multiple streaming services? Netflix does note that while Hulu is successful in the US, its absence from global markets makes it a relatively small competitor on a global scale. Additionally, Netflix acknowledges YouTube as a rival for consumers’ attention. It claims that when YouTube went down last October, it saw a spike in viewership and new signups – a strong sign that YouTube is also competing for the same eyeballs. Netflix believes it will be able to continue to compete and win over customers in this highly-fragmented market by investing in and creating exceptional content. Currently, Netflix has three main avenues of content generation for its customers: Licensing, Partnerships, and Production/Ownership. Licensing - Netflix stated that it will continue to license popular content from other producers (shows including The Office and Friends) as long as the company is able to. 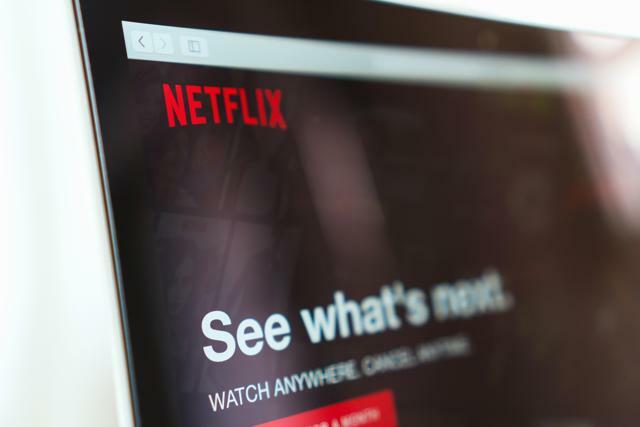 However, Netflix is prepared to continue to make this a smaller fraction of its overall available content as the producers of this content begin launching their own streaming services (AT&T, Disney, WarnerMedia, etc.) and no longer wish to renew their licensing deals. Co-Production – In this model, Netflix has been partnering with networks in a particular country that will produce the content in collaboration with Netflix, then release the content in its country while Netflix will premier it on its platform every else in the world. The most successful example of this is the co-production (with BBC in the UK) of Bodyguard, which received 20 million views in the first 4 weeks on Netflix. Production/Ownership – 6 years ago Netflix began creating and producing its own original content, in the anticipation that networks would no longer want to license to Netflix. 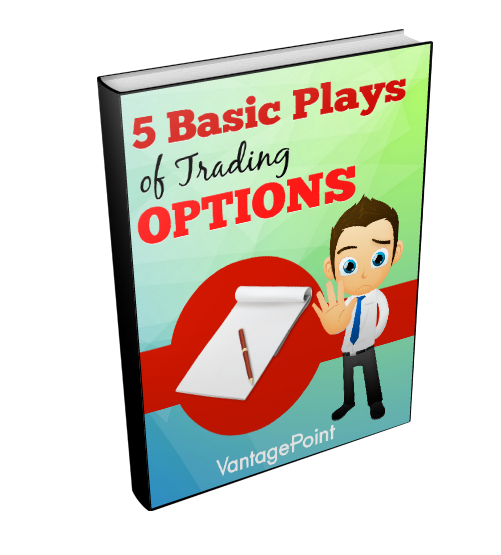 While this model has the highest upfront cost, it also has the highest return on investment. In 2018, Netflix spent roughly $7.5B on the production of content, and expects it to continue to grow. The most successful original content Netflix has produced is the movie Bird Boxwhich was streamed in 80 million households in its first 4 weeks on Netflix. Netflix ended 2018 on a strong note, reporting annual revenue growth of 35% to $16B. Additionally, Netflix nearly doubled its operating profit from $838.7MM in FY2017 to $1.6B in FY2018, representing 91% year-over-year (YoY) growth. On a quarterly basis, Netflix reported 4Q18 revenues and operating profit of $4.2B and $216MM, respectively. The explosive growth in revenue and operating profit was primarily driven by an addition of new paying memberships of 8.8 million from quarter start (1.7 million in the US and 7.3 million internationally) and 29 million from the beginning of the year. Netflix’s quarterly net additions of 8.8 million represented 33% YoY growth and beat its beginning-of-quarter expectation of 7.6 million. This growth brought Netflix’s total Global Streaming Paid Memberships to 139.26 million. 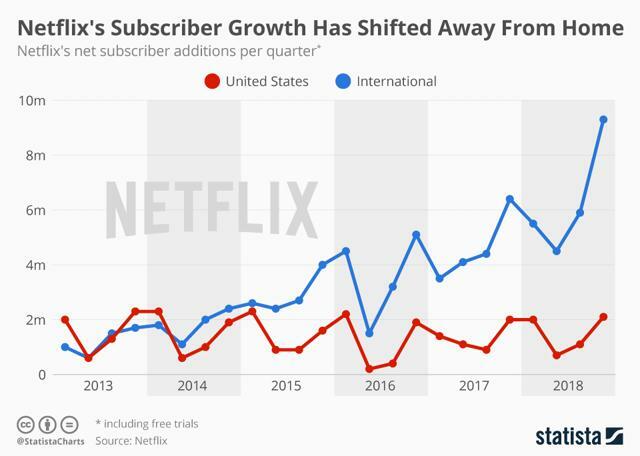 While Netflix continues to add subscribers domestically, the majority of its subscriber growth is coming from international markets, as shown below. Looking at the company’s margins, Netflix reported a 300 bps increase in operating margin to 10% in 2018 from 7% in 2017. The improvement in operating margin is the result of Netflix’s multi-year plan to significantly grow content while increasing revenue faster to expand its operating margin. 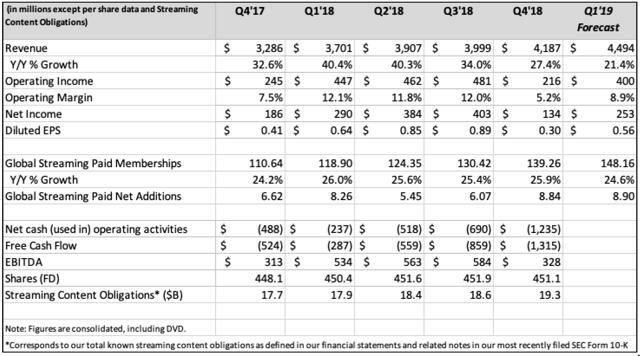 Netflix’s 4Q18 operating margin fell slightly to 5.2% from 7.5% at 4Q17. The decline in quarterly operating margin is the result of Netflix launching several new titles during 4Q18. It should be noted that most of Netflix’s revenue is not in U.S. dollars; as such, when foreign exchange (FX) prices move significantly Netflix’s top line can reflect proportionate changes. To help alleviate the fluctuations in FX, Netflix adjusts prices and costs over time. Additionally, Netflix does not hedge its FX exposure, resulting in short-term margin fluctuations. Netflix reported FY 2018 interest expense of $420.5MM, a 77% increase from FY 2017’s interest expense of $238.2MM. The significant increase in interest expense primarily comes from a 59% increase in long-term debt as well as the rising rate environment. This is a line item that should be continued to be monitored as Netflix continues to fund its operations through raising additional debt capital. FY 2018 Net income and Diluted EPS were reported at $1.2B and $2.68, respectively, compared to $559MM and $1.25, respectively, in FY 2017. The 2018 increase comes from Netflix’s top-line revenue growth and operating margin improvement. Free Cash Flow (FCF) in 4Q18 was ($1.3B) compared to ($0.5B) in 4Q17, bringing FY 2018 FCF to ($3.0B). This remained in line with Netflix’s 2018 FCF forecast of ($3B) to ($4B). Netflix reported $10.6B in long-term debt at FYE 2018, which included €1.1B 4.625% senior notes and $800MM 6.375 senior notes (with a weighted average coupon of 5.3%) that was raised during 4Q18. Netflix’s $10.6B in long-term debt at FYE 2018 represented a 59.4% increase in debt from FYE 2017 reported debt of $6.5B. 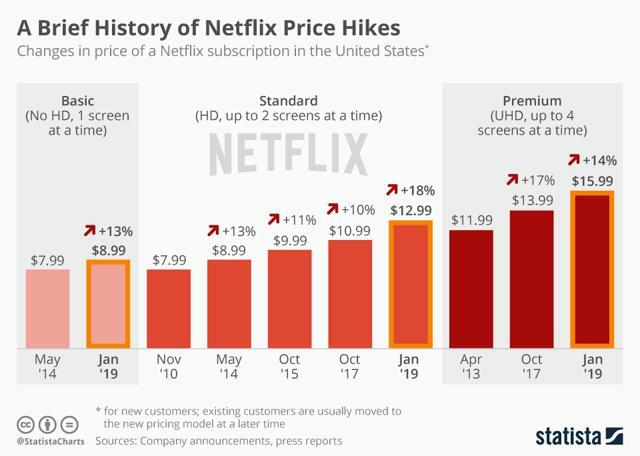 Additionally, Netflix announced that it will be raising subscription prices of its most popular plan to $13 per month from $11 and its basic plan from $8 to $9. Management expressed that the increase in pricing is to continue to facilitate investment in great entertainment and improving the overall Netflix experience for the benefit of its members. 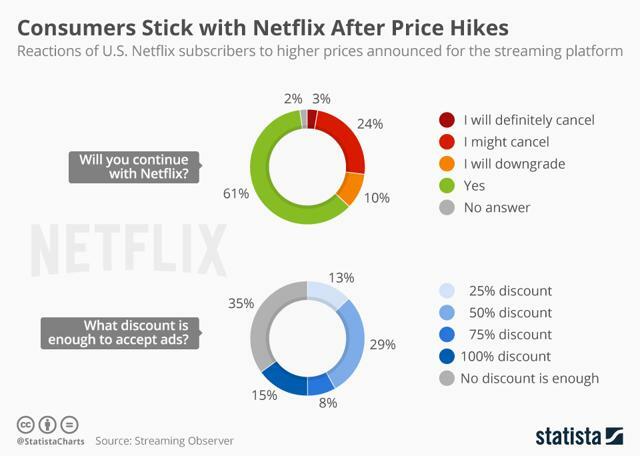 According to a survey conducted by Statista, only 3% of respondents claimed they “will definitely cancel” their membership due to the recent price increase. This speaks to the entrenchment Netflix has in today’s society, which is a strong sign for investors. Below is a chart outlining Netflix’s increases over its history. Netflix’s January increase represents only its 4th (and largest at 18%) price increase since the company started in 2010. After a strong 2018, Netflix looks to continue its growth into 2019. 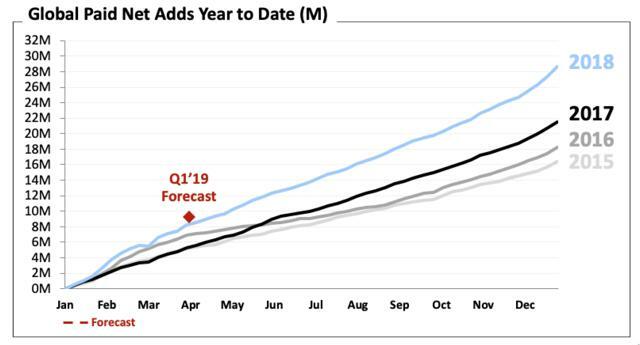 For the 1Q19 period, Netflix is forecasting revenue of approximately $4.5B, representing 21.4% YoY growth from $3.7B in revenue during 1Q18. Netflix’s revenue growth is forecasted to be driven by 8% YoY growth in subscribers. The company is forecasting 8.9 million net additions in subscribers, with 1.6 million in the US and 7.3 million internationally. This will represent 24.6% YoY growth and bring total paid subscribers to 148.15 million. Additionally, the recent price increase for US members is expected to play a role in revenue growth as the new pricing is phased in for existing customers over 1Q19 and 2Q19. Netflix makes note in its investor letter that it expects subscriber growth to be fairly consistent while revenue growth might vary due to FX changes and the timing of price changes across different markets. For 1Q19, the company is targeting a 9% operating margin, with it growing to 13% by the end of 2019. This compares to a 1Q18 and FYE 2018 operating margin of 12.1% and 10%, respectively. Netflix is forecasting Net Income and Earnings Per Share (EPS) of $253MM and $0.56 per share, respectively. This is compared to 1Q18 Net Income and EPS of $290MM and $0.64 per share, respectively. While Netflix has not explicitly stated how much it has spent on content, the company has eluded to spending roughly $8B in 2018, and stated that it expects to continue to grow in line with its revenue growth. Netflix stated that it expects its 2019 Free Cash Flow to remain in line with its 2018 results of ($3B). Netflix believes that after 2019 it will see it materially improve (assuming the company doesn’t do any material transactions) each year after. The company believes that its improvement in FCF will be driven by its growing operating margin that will allow it to fund more of its investments internally. 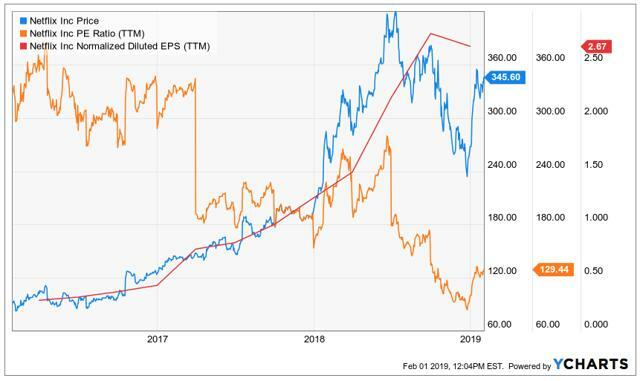 In the meantime, Netflix will continue to fund its cash flow needs through the high yield market as long as it believes its marginal after-tax cost of debt will be lower than its marginal cost of equity. From a valuation perspective, many investors will shy away from Netflix because of its high P/E ratio, and for many investors, avoidance is justified. However, we've seen Netflix trading at high P/E ratios in the past. Just three years ago, it traded at a PE of over 300. So today's PE of 129 looks like a bargain. Kidding aside, EPS has grown considerably over the last three years and reached $2.67 recently. Next years EPS consensus estimates call for earnings of $4.07 per share followed in 2020 by an increase to $6.41. All of a sudden you're looking at a forward P/E of 50 – still high but nowhere near current levels. Analysts consensus price target is $391, which gives the stock an upside potential of 15%. We think that's conservative and that price targets will be adjusted upward as soon as analysts can incorporate new information provided by the company during the last earnings call. The stock will remain volatile and will likely move up or down considerably every time there is news about one of the other streaming video competitors. If Disney's integration of Hulu and the Fox content is reported to be going well, the stock might take a hit, while any challenges publicized by competitors will be a boon to the price. We believe Netflix will remain the industry leader for quite some time, even as some of its content is 'taken back' by the networks. This means investors have to be patient with the higher upfront costs of producing their own content for the long-term benefit of higher margins and more importantly, less dependence on would be competitors. We rate the stock a buy and has a price target of $400.